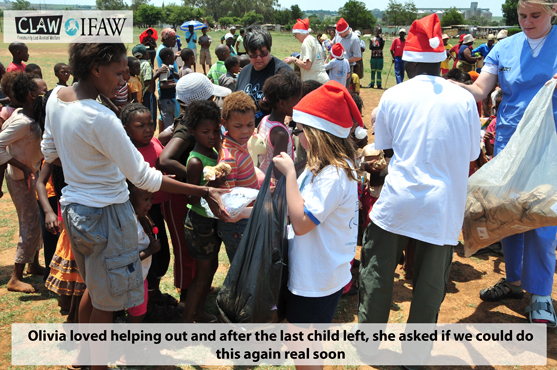 As we started planning for our trip to South Africa over 9-months ago, we reached out to the folks from IFAW (International Fund for Animal Welfare) in an effort to find ways we could work together with them to help raise awareness to the issues facing endangered species. As we built our relationship with their US office, they then introduced us to their South African office located in Cape Town and to their amazing liaison Lisa. 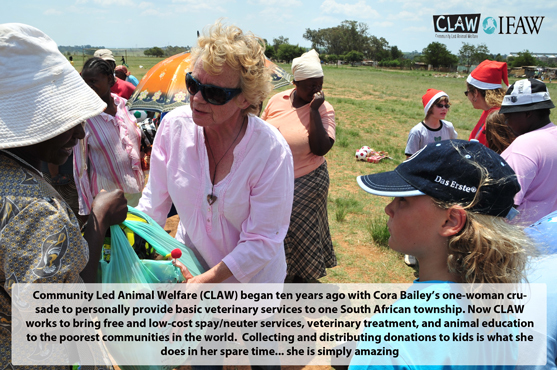 As we learned more about their mission in South Africa, we found out that IFAW strongly supported an incredible organization called CLAW (Community Led Animal Welfare) which began ten years ago with Cora Bailey’s one-woman crusade to personally provide basic veterinary services to one South African township. 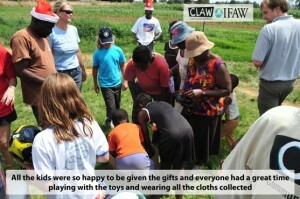 Now CLAW works to bring free and low-cost spay/neuter services, veterinary treatment, and animal education to the poorest communities in the world. 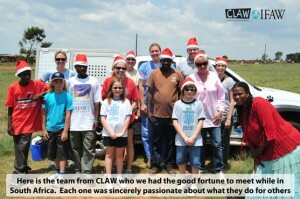 Since its inception in 1999, CLAW’s mobile teams of veterinarians and community volunteers have treated, vaccinated, and sterilized thousands of pets. CLAW also provides other mobile services such as flea dipping, de-worming, emergency care, adoption services, humane euthanasia, pet education, and community awareness events. 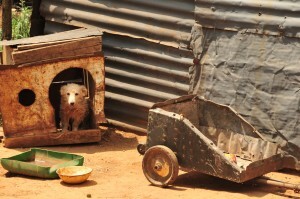 The welfare of these animals is intimately linked to the welfare of the communities in which they live. CLAW programs are culturally sensitive and network with other community-based organizations to help provide an improved quality of life for the people and communities in which they work. Many human-aid charity groups have recognized CLAW’s holistic non-exclusive approach, and CLAW’s extended network is improving the lives of thousands. But it doesn’t stop there. 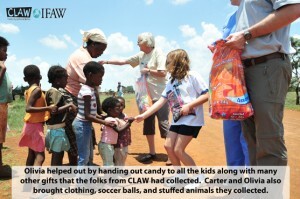 We also learned that (in their spare time) CLAW distributes food parcels, facilitates a home-based care program to teach people how to care for the sick and dying, runs food gardens, supports child-headed households and helps communities access health and hospice care, not to mention hosting annual Christmas events for hundreds of needy and impoverished children and their families. After learning of all that they do, we could only say “OMG” and ask how we might be of assistance with their efforts. Lisa put us in touch with Cora and collectively we started to plan our strategy. As you know, OMG is all about raising awareness for the plight of endangered species and trying to educate students and communities about plastic pollution. Our focus has never changed from the beginning, but we are also open-minded enough to see how things are connected and why you have to be flexible in your approach. 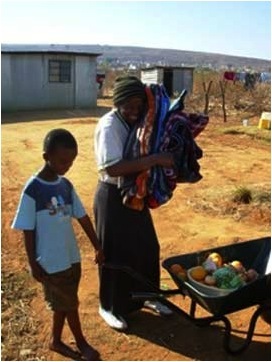 Cora told us that when they go to villages and townships seeking to help all of their neglected animals, it is very difficult to get families to listen to them talk about the need to provide their dogs and cats with clean drinking water and sufficient shelter when the families themselves often go without any of these basic needs. She said she learned this lesson early on which has forced CLAW to broaden their approach and also find ways to help the people as well. She told us that every Saturday, they would visit a different township and try to deliver humanitarian supplies to the folks as they continued to help the animals as well. 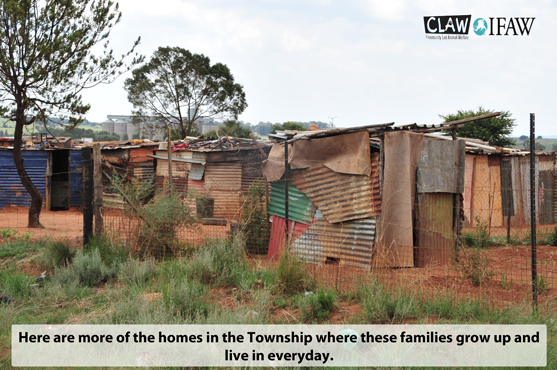 While on one of our conference calls with Lisa and Cora, we learned that the children in these townships usually were the ones hardest hit by the circumstances they lived in. 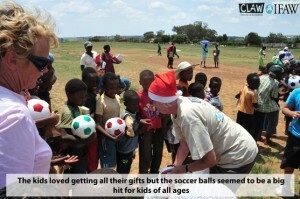 We also learned that the kids loved playing soccer. 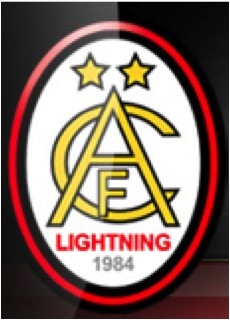 After hearing this Carter (who plays on a soccer league) decided to reach out to the president of his soccer league (AFC Lightning) and ask if he could help us collect soccer balls and used soccer clothing etc for us to possibly donate to CLAW for when they visit these villages. Carter also reached out to his goalkeeper coach (Glen Fox) who runs The Southern Crescent Goalkeeping Academy asking if he too could help us out. Our goal was to collect enough supplies so that we could bring a little cheer to all the kids of the township during our visit. 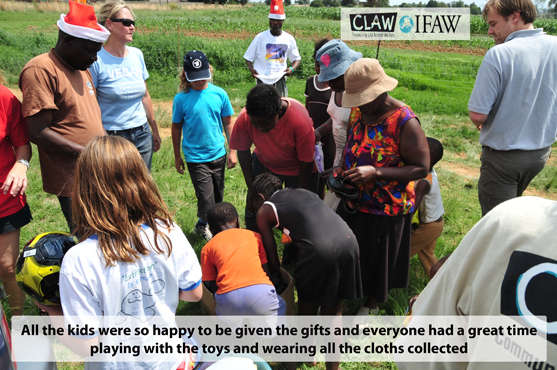 Olivia then also sprang to action by clearing out her closet and toy chests with tons of stuffed toys, clothing and assorted toys which she wanted to give to these kids during our visit. She also mentioned to her pottery teacher about the impending trip and her teacher spent days making over 50 handmade clay Heart 2 Heart necklaces for Olivia to bring along. 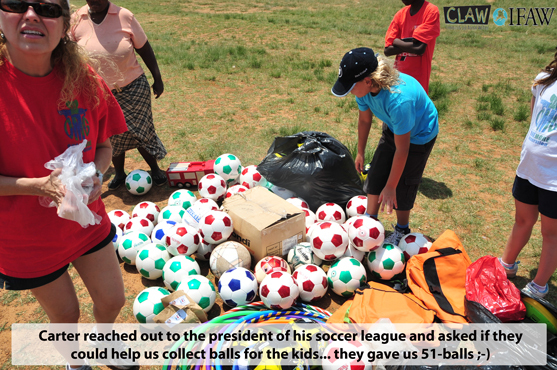 Then, to our surprise, the president at the AFC Lightning Soccer League called us up to announce they were delivering 51 – brand new (deflated) soccer balls for our trip. We also started getting calls from families involved with Carter’s soccer league and teammates from his goalkeeping camp that they too had used soccer items for our trip. 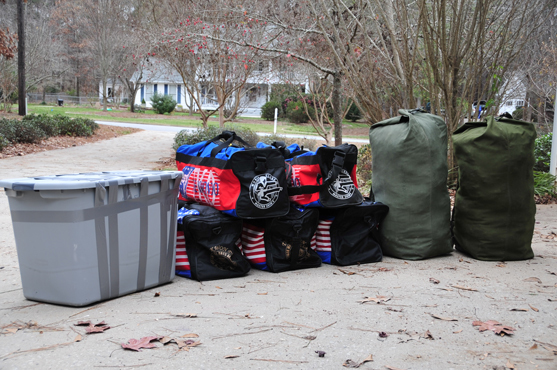 Before long, we had collected over 8-large military-style duffle bags full of donations for our trip. The next step was to see if we could get assistance from one of the airlines on taking all these items over with us without it being cost prohibitive. Unfortunately, time was not on our side and we were unable to get the needed waivers so we had to unpack almost all of our personal belongings to make room for the donations. We were each allowed two pieces of checked luggage (which was the eight fully loaded duffle bags of donations) and two small carry on bags per person (which now contained our limited change of clothing). Then the day finally came when we were headed for South Africa. When we arrived, Cora was kind enough to meet us at the Johannesburg Airport and helped load all the donations in her truck and then lead us to the guesthouse we were staying at. BTW, if you’re ever in the need for comfortable, safe and reasonable accommodations in the outskirts of “Jo’burg”, we highly recommend staying at the Soofah Guest House which is run by the Soloman family who definitely cares for their guests. You can reach them at info@sooffah.com and make sure you ask for Fatima and don’t forget to tell them that OMG sent you. After a day of Olivia and Carter visiting their adopted cheetah’s, we were ready to meet up with Cora and her team to head out to one of the townships to deliver the donations we brought along. Cora met us in the morning and we headed over to her clinic where we met many of their staff and volunteers. In total, Cora’s team filled four vehicles along with lots of donations from CLAW, IFAW, and OMG. 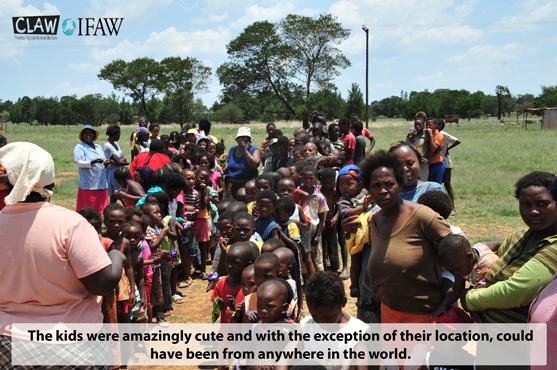 We drove for just under two hours to the remote township where we arrived unannounced. A few of the local volunteers who work with Cora went into the village to let them know why we were there and asked that they help round up the children. Within minutes, kids started coming out of their meager dwellings to see what all the commotion was all about. 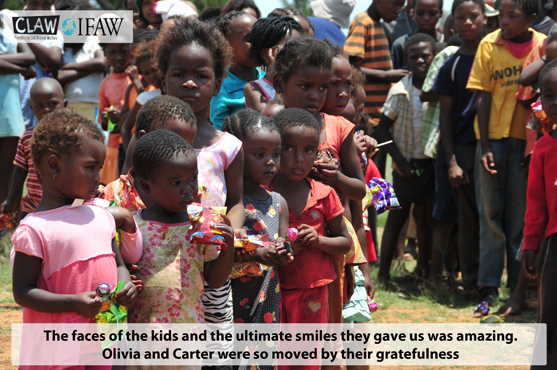 Carter and Olivia were among the first to greet the kids and to help them feel comfortable with us being there. The folks at CLAW have obviously done these hundreds of times because they knew exactly what needed to be done and in what order to ensure we were not mobbed by the sudden influx of curious kids. Everywhere you looked, kids were coming out of their dwellings as the word spread that we had arrived. 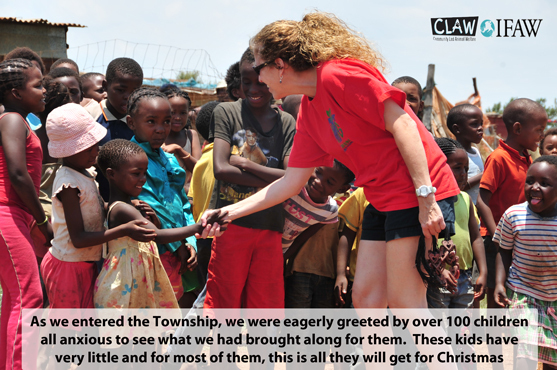 The CLAW team quickly announced why we had arrived and also gave clear instructions to the villagers as they lined up to meet us. 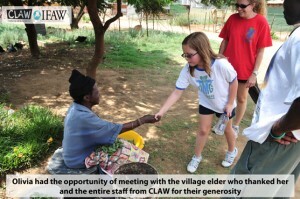 CLAW frequently visits these remote townships and they are always cautious to ensure they look at helping out in any way possible. 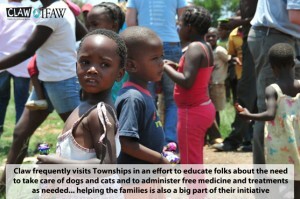 Addressing the needs of the children and families in these villages is just as important as helping the dogs and cats. 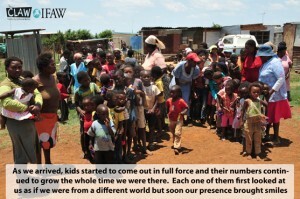 Before we knew it, we had over 50 kids around us and the numbers were still growing. The staff from CLAW quickly went to work emptying the vehicles with the donations and started setting up areas where we would be handing out the items to the children. The children were all very curious and excited at the same time. 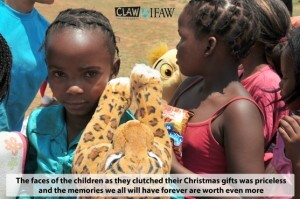 Word had spread that we had arrived with gifts for the children and they were all anxious to see what we had brought. Olivia and Carter were both a little overwhelmed by the sheer number of kids and to the conditions they lived in. Cora was quick to see their expressions and quickly stepped in to assure them that they needed to focus on the good our visit was bringing to these children, as opposed to the sight of their living conditions. As they handed out more and more of the items CLAW had brought along, Olivia and Carter became less concerned with the conditions of the township and they sincerely started to enjoy the smiles and laughter of the kids as they received the items we brought along. Each child was able to express their gratefulness and excitement, even with the language barrier. Their expressions said it all despite the fact though they did not have much on their own, the gifts CLAW brought along helped them forget any issues they had, even if it was just for the afternoon. 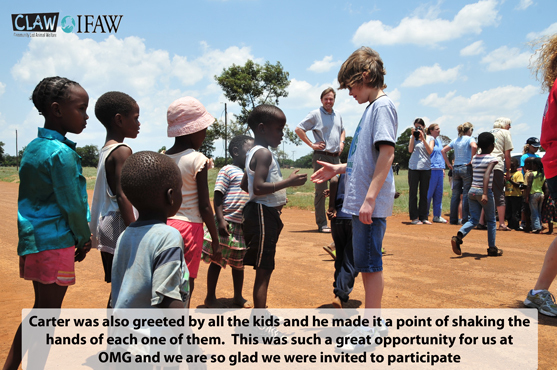 After a while of handing out some of the gifts, Carter said to me that he noticed that these kids were no different than any other kids he had met in different parts of the world. 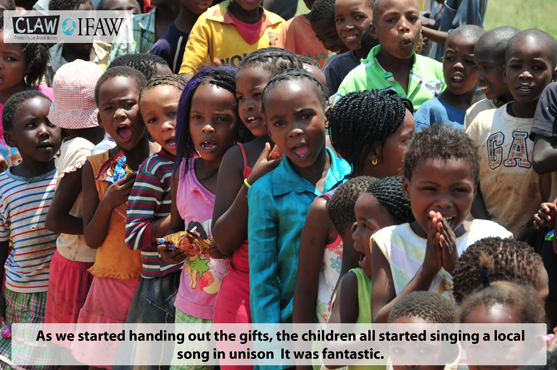 They all loved to get gifts and they especially liked to play with toys. I think the best part for Olivia was when all the kids started to sing and dance in unison as a way of expressing their gratitude for everything the entire CLAW team was doing for them. She said to me that she liked the songs and was impressed that the girls all seemed to gravitate to her. One of my favorite moments during our visit to the village was watching the expressions on the children’s faces as we started handing out some of Olivia’s stuffed toys. 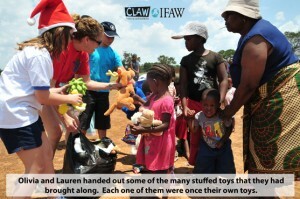 It was as if many of these kids had never seen stuffed toys before. Their eyes were wide open as they clutched the toys hard against their faces and giggled wildly. Most of the CLAW staff had apparently seen these looks before but it was obvious that they were each moved in their own way by the effects of their actions. It was such a pleasure for us to be part of this amazing experience. Here you can see what we saw in the eyes of these kids as they accepted the donations. The looks are something we will never forget and one I hope everyone has an opportunity to witness in their lifetime. As we started the task of handing out the donations, the folks at CLAW had strategically laid out what items were to be given out first, second, etc. At first, it was not clear to me that they had a definitive game plan but as the afternoon went on, it became clear they really knew what they were doing. This became apparent as they then started to line up all the donated soccer balls we brought along with some of the soccer balls they received from the famed Manchester United Soccer Team. 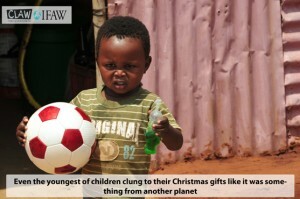 The soccer balls seemed to be the favorite gift for kids of all ages. As we started handing them out, we noticed that the size of the group surrounding us had doubled. 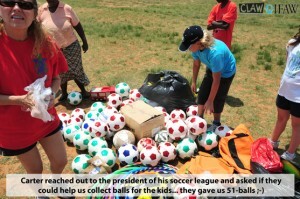 Now there were more than 100 kids and each one clambering to see if they were getting a soccer ball. This is where the experience of the CLAW team was so important. They really had control of every situation and made sure that everyone was taken care of. Cora, who was the obvious leader amongst the entire event was amazing to watch. She has so much sincere passion for what she does and clearly cares for every single child and family member in the township. Her dedication and drive was unlike anything we had seen prior and definitely something we can only hope that we might be able to emulate someday. The entire team from CLAW was so impressive. Each one worked at full-steam from the moment they arrived and they never let up. It was such an exhilarating experience for us to be part of this event and I am so grateful that they allowed us to be part of what they do on a regular basis. Even though everyone kept smiles on their faces throughout the visit to the village, the toll on your emotions was noticeable (if you knew where to look). I can’t imagine what it must be like for these brave souls on a regular basis when faced with such adversity. 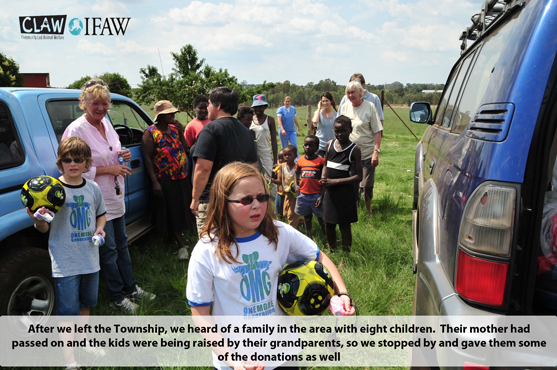 After we had handed out enough donations and the crowd started to disperse, Olivia and Carter were invited to tour the township so they could get a better feel of what life is like for the children. 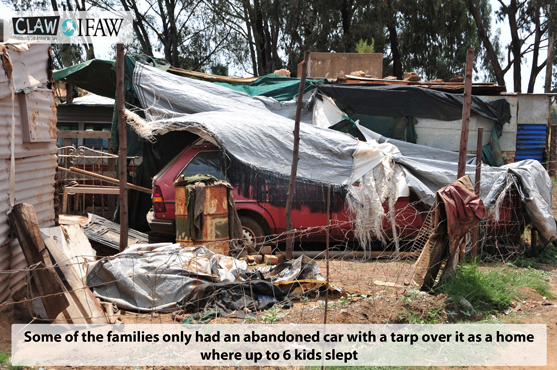 As we walked through the dirt roads amongst the shacks, you couldn’t help notice that virtually every family living in this village had a large number of occupants living in these cramped and meager conditions. As we walked through the streets, we were summoned over to meet with one of the village elders. The lady who told us she was in her eighties was sitting under a shade tree preparing the vegetables for their daily porridge (as they referred to it). We were impressed by her obvious good health considering her age and the conditions they were forced to live in and especially when you consider that the average life expectancy of someone living in South Africa (in these conditions) is only 37. Aids, alcoholism, violence and even the occasional Xenophobic attacks, which still plague the region, all contributing to the short life expectancy. As we walked on through the Township, we were pleased to see kids happily playing with the soccer balls we had brought. They obviously were a big hit. On more than one occasion we saw kids running barefoot through the stone filled streets kicking the balls around looking for a chance of getting a game started. 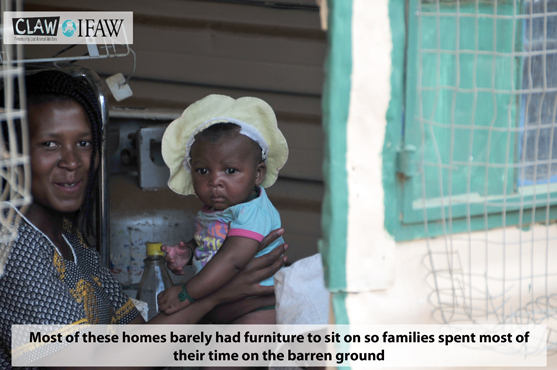 As we continued, we repeatedly saw families sitting on the floors of their open shacks because they had no furniture. 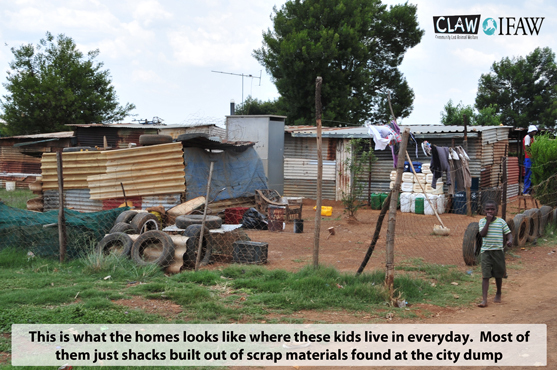 We saw homes about the size of an average kitchen with 10 to 15 people living in it. We saw what looked like a pile of rubble where your first thought was that the village was stacking excess materials to maybe build another shack, only to see several kids emerging as we walked by and then learned that the pile of rubble was actually their home. But one thing we did notice amongst all this overwhelming poverty as we continued through the end of our tour, and that was the smiles on the children’s faces as they saw us pass by. Virtually every child we passed stopped to wave to us as if they were saying thanks for our visit and for the gifts were we able to bring along. 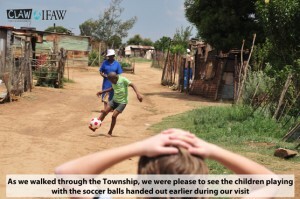 As we left the township, someone had contacted Cora about a family consisting of eight kids being brought up by their Grandmother. Apparently, their mother had passed on and their dad was nowhere to be found. The Grandmother was struggling to keep the kids clothed, etc. After hearing this, Cora quickly diverted the team to head for the families home. Once we arrived, we were greeted by the grandmother and all the kids living in their small quarters. Olivia was quick to make sure each of the girls in this household received one of the special clay necklaces that her pottery teacher personally handmade for our trip. The girls were all so surprised at the gifts and each one proudly placed the necklace over their heads and ran to look at their reflection in the car windows. 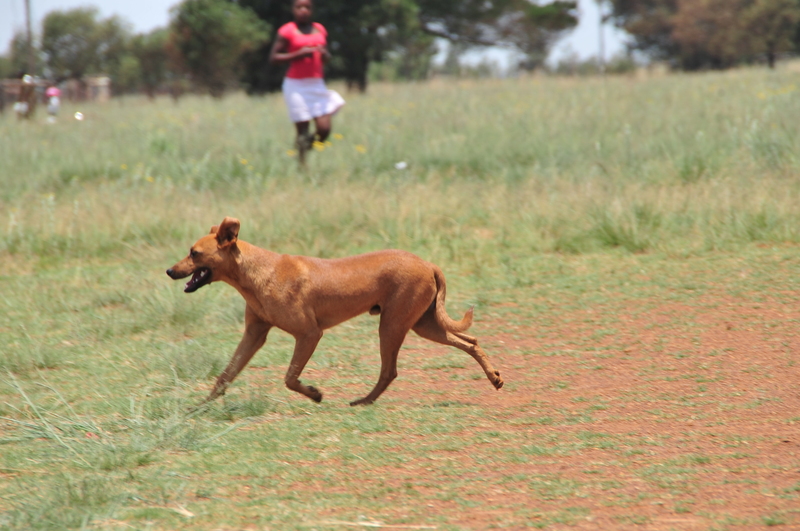 After we left the families home, we started heading on the long trip back to the CLAW clinic. 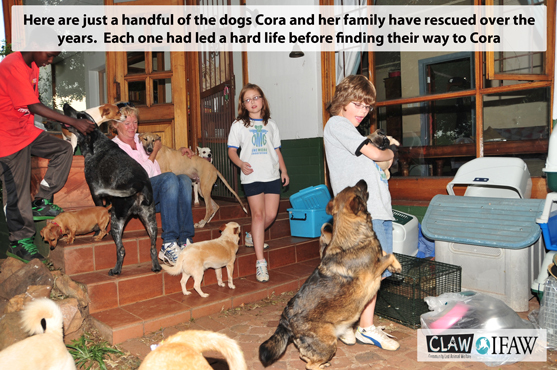 Once everything was unpacked and returned to the clinic, we were invited to Cora’s house so Carter and Olivia could finally meet the 21-dogs, over a dozen cats and two birds which she and her tolerating family care for. The kids loved all the animals and hearing the heartbreaking stories behind each of these rescued animals made it even more interesting. They also loved hearing the unique names they had given these animals. 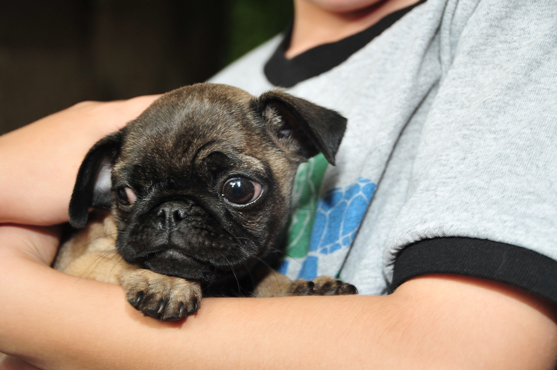 Cora had told the kids about a special little pug dog which they recently found. Both Carter and Olivia immediately fell in love with the cute little puppy. If the puppy was a little older and was allowed to travel, I am sure we would have been coming back to the USA with another special pet. As we returned to the guesthouse where we were staying we noticed that Olivia and Carter were surprisingly happy and alert. 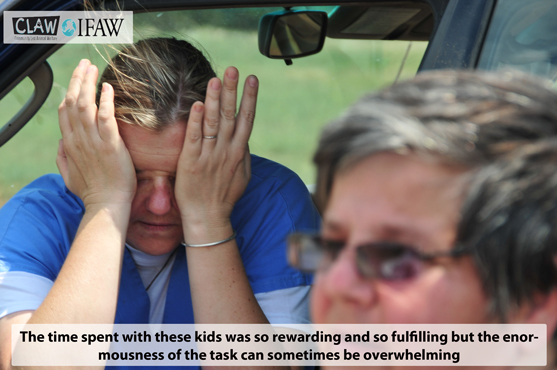 We did not know what to expect from them after seeing the hardship the other children endured. We were a little concerned that the images might be too harsh for them at this age, but to my amazement, they both were moved by the experience but moved in a positive way. They both asked us when we might have an opportunity to do it again. It seems they thoroughly enjoyed the day’s events and if anything, they are more motivated to help now, than they may have been in the past. All of us at OMG were deeply moved by Cora and her entire team’s dedication. We were moved by how sincere she is in wanting to make a difference, not only for animals but also for everyone she meets who needs help. I hope you will visit the website of CLAW and that you will consider showing Cora and her staff your support. Words and even the pictures we took can not fully express the immense passion Cora has for everything she does. Even though Cora and her organization are halfway around the world, we are convinced that the world is a better place because of all she does. 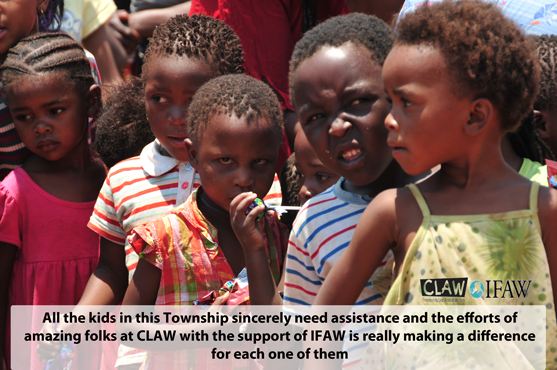 We wish to thank everyone at CLAW and the folks at IFAW for allowing us to be part of their world and we excitedly look forward to the next venture we can experience with both organizations.